It’s always good to get help from family when you’re starting up a new business. But few new firms are lucky enough to win a huge contract with a vast, state-owned company before they even have a ready product to show the market. For that, it helps if Dad happens to be the head of the state company. At least that seems to be the case with startup Clever Apartments, or CLAP, which in July 2017 struck a contract with Ukrainian state-owned construction giant Ukrbud. CLAP makes a multipurpose smart home system in which domestic appliances are controlled via a mobile app. The system protects against fires, flooding, and theft, and helps users save money on utility payments. Yet with only a prototype to show for its two years of work, and still mulling its strategy for manufacturing and selling the systems, CLAP has already won a big contract — with Ukrbud Development, a company associated with the huge state-owned Ukrbud corporation. 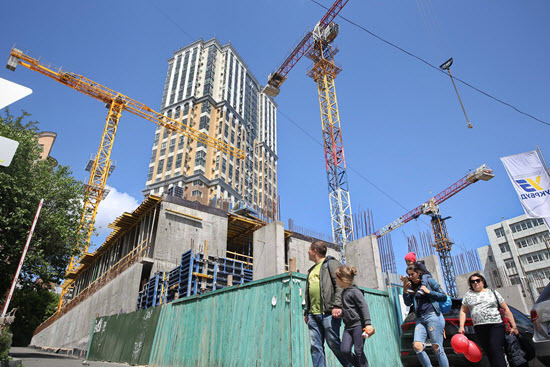 The contract is huge too: Ukrbud Development is currently constructing 50 multistory buildings in Kyiv designed to be compatible with the CLAP system. And there will be many more, as the firms have signed a three-year contract to form an exclusive partnership in the capital. According to the deal, the CLAP smart home system will be included in the price of an apartment, but it won’t be pre-installed. Instead, new owners will get a certificate for free installation, which they can use after they have finished decorating. CLAP, in turn, is designing special software for Ukrbud buildings, and there will be features in these buildings that will not be available elsewhere. Such a major contract, however, might have been an easy catch for CLAP’s CEO Oleksandr Poymanov, as his father Serhiy Poymanov is Ukrbud’s boss. But both firms, Ukrbud and CLAP, said their family connections had nothing to do with the agreement. Moreover, during an initial interview with the Kyiv Post, CLAP’s head Poymanov didn’t even mention he had family ties with Ukrbud. “After a long and difficult negotiating process, and many meetings, (I) managed to convince the management of the company that CLAP was promising,” Poymanov said. Poymanov emphasized that he signed a contract not with Ukrbud itself, but with its private arm — Ukrbud Development. It’s “only a member of the Ukrbud corporation,” and does not get state financing nor dispose of state property, Poymanov said. However, in opinion columns about his startup, Poymanov had never made the distinction clear. CLAP’s principal investor and co-owner, Maxim Mykytas, who invested $60,000 in the startup, is also a famous builder — he’s the former head of Ukrbud and allegedly a good friend of Kyiv Mayor Vitali Klitschko and is also a deputy of Ukraine’s parliament. Mykytas was involved in several major construction scandals when he was head of Ukrbud from 2010 to 2016. He is also a beneficiary of Ukrbud Development, the company that made an official agreement with CLAP. Poymanov said he met Mykytas only after there was already a preliminary agreement with Ukrbud Development. “And taking into account that we needed resources and financing, Ukrbud’s management proposed that Mykytas become one of the investors… (in CLAP),” Poymanov said. Mykytas now owns 50 percent of CLAP. The company’s legal name is Innovaciyny Comfort Ltd.
Poymanov says that since Ukrbud Development is a private company, his father has no influence over the decisions it makes. Ukrbud spokesperson Gleb Shemovnev confirmed that to the Kyiv Post, saying that all the companies that are members of Ukrbud corporation operate independently and are not responsible to the government. Shemovnev refused to share the statutory documents of the company with the Kyiv Post. Poymanov of CLAP was surprised when the Kyiv Post started asking him about his father. “Nobody thought that the fact that (we are) relatives would raise questions from the public or the media,” he said. The Kyiv Post’s technology coverage is sponsored by Ciklum and NIX Solutions. The content is independent of the donors.